The Mars Exploration Rover Opportunity is hunkered down in low power mode. When you get your power from solar panels, atmospheric opacity is a pretty big deal, and its not very good right now. 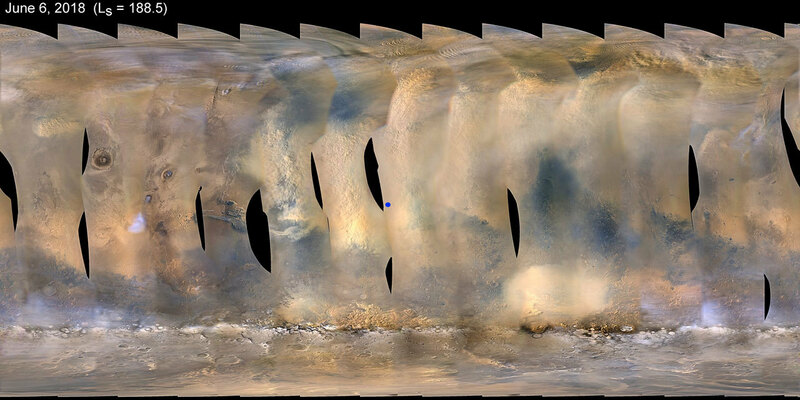 A 7 million square mile dust storm is passing over the rover, that’s about the size of North America. The team running the rover from NASA’s Jet Propulsion Laboratory in Pasadena California are confident this golf cart sized rover will make it through just fine. She’s been through storms before. This storm is estimated at a tau of 10.8 as of Sunday morning. It’s an exponential scale. So the rover is basically in the dark. On Sunday, engineers received signals from the rover in the middle of the storm, a good sign that battery levels remain good. If you’ve seen the movie “The Martian” dust storms on Mars are nothing like the opening act. There isn’t enough atmosphere to produce the winds depicted there. Mars atmosphere is about 1/100th that of Earth. The primary danger dust storms pose to robots, or eventually people, on Mars is visibility. The latest temperature report was a balmy -20F / -29C. One of the nice things about dust storms is that they tend to absorb some heat raising the ambient temperature around the rover, even at night, reducing the need for heaters to keep the rover alive. Dust storms can also clean a bit of accumulated dust off solar panels leading to increased power production on the other side. Here’s hoping. Today is Opportunity’s 5111st Martian day or Sol of it’s 90 sol primary mission. That’s not unlike getting more than 500 years out of the family car.